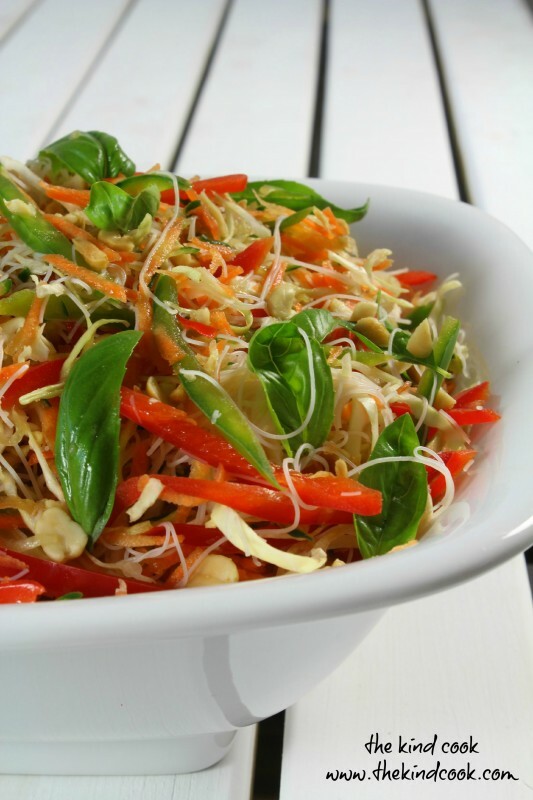 Place the cabbage, carrots, capsicum and cucumber in a large bowl, stir to combine and set aside. Whisk the sugar, salt, fish sauce, garlic, lime juice, stock and olive oil together in another bowl until well combined and set aside. Cook the rice noodles as per the packet instructions. Drain and refresh slightly under cold water. Then toss the noodles through the vegetable mix. Pour the sauce over the top of the vegetables and noodles and stir. Add some fresh red chilli if you want some heat. Mix though loads the fresh basil leaves just before serving. Garnish with the peanuts and fried shallots. Serves: 2 EPIC serves or 4 small. Or take as a salad to share at a BBQ.